Almost a decade before Warcraft became synonymous with World of Warcraft (WOW), the juggernaut of massively mutliplayer online role-playing games (MMORPG), and a year before Blizzard would dazzle the world with Diablo, Warcraft II: Tides of Darkness ruled the gaming industry. 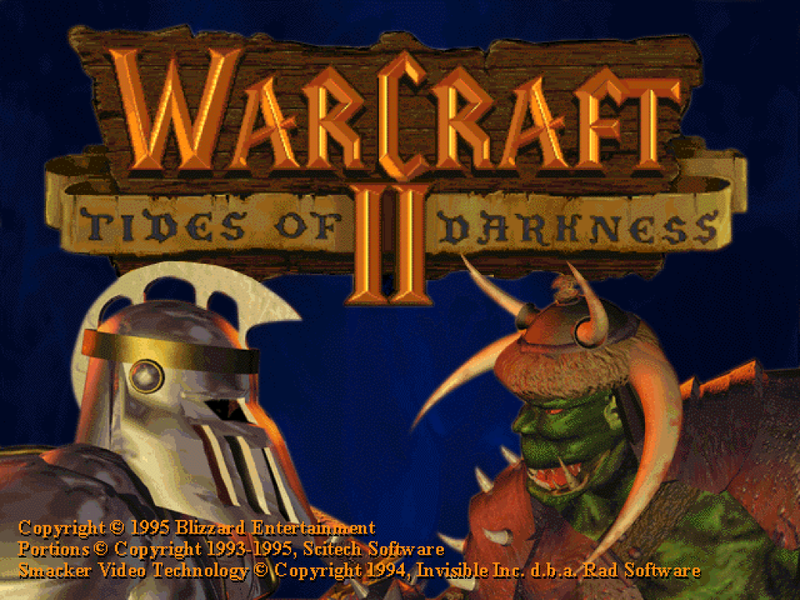 Released in 1995, as the follow up to Warcraft: Orcs & Humans, Warcraft II: Tides of Darkness, was a real-time fantasy strategy that game won almost every award there was to win in 1996 and sold over 2 million copies. Its predecessor Warcraft: Orcs & Humans had collected good reviews, won some awards while coming close as a finalist to others, and was the first real-time strategy game to gain large scale commercial success. Three months after the release of Warcraft: Orcs & Humans, Blizzard started development on Warcraft II: Tides of Darkness, which would be released nine months later, having improved on Orcs & Humans in almost every measurable scope of gameplay. 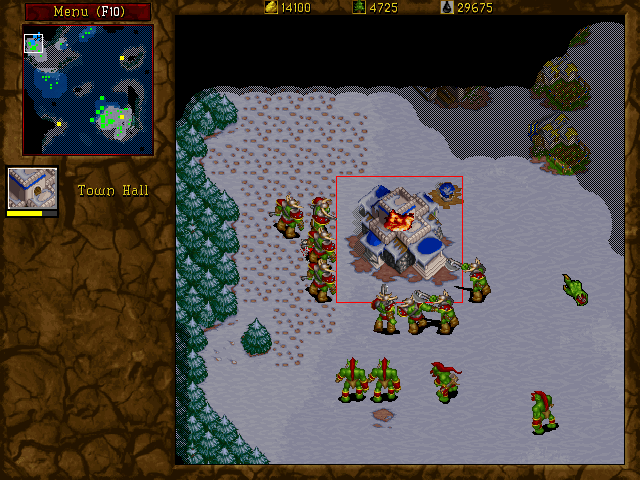 Warcraft II: Tides of Darkness, as a real-time strategy game, was still fairly revolutionary. Upon its release, the real-time strategy game genre was still in its infancy with limited related titles only including Westwood Studios’ Command and Conquer in 1995. Tides of Darkness ushered in a new level of legitimacy for the genre at the end of that year. 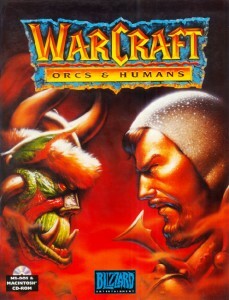 As one of the pioneers in the real-time strategy genre, Warcraft II was wonderful because Blizzard took what it had done and learned from Warcraft: Orcs & Humans and made it better across the board, including the artificial intelligence of single player and the computer players in multiplayer mode. This enhanced AI made both single and multiplayer versions of the game highly replayable and addicting. No matter your game mode, you have one main choice when setting up your game: will you play as the Humans with allies like Elves, Gnomes and Dwarves of the Alliance or would you play as the Orcs with allies like Trolls, Goblins and Ogres of the Horde? This was an upgrade over the original game, because the Humans and Orcs in that version had no allies. In singleplayer mode, whichever side you choose is in opposition of the other. In fact, the only imbalance between the two enemies was that a Bloodlusted Ogre Mage from the Horde was possibly the most powerful unit in the game, but that doesn’t mean choosing Orc and being in the Horde meant victory. That key element was determined by how well you managed your units and built your buildings. In single player there are 14 levels, and regardless of which race you choose to play, the levels mirror each other. 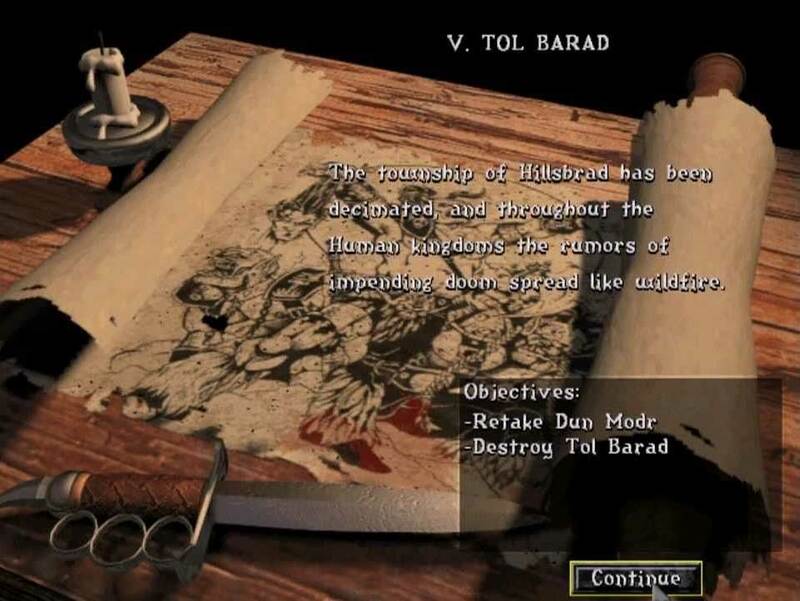 For example, the Human level IV, “Attack on Zul’dare” is militarily and objectively no different than level “The Badlands” in the Orc campaign. The levels obviously get progressively harder. The simple starter levels are just that – not all units and advancements are available at the start but slowly unlock and are often part of your level or mission objectives. I enjoyed playing though the single player recently as both Human and Orc and found it just as enjoyable as I did when I was playing the game many years ago. I remembered most of the keyboard shortcuts and was pleasantly surprised at how well all of the creature and sound effects hold up. I did play a few multiplayer games with the AI, but it’s not as fun as the LAN parties that I used to attend back in 1996. This game was one of the first non-first-person shooters to have quite the online following, so much so that when Blizzard launched Battle.net for Diablo they also incorporated Warcraft II into it, making the original online platform of Kali obsolete. LAN parties were quite common with Warcraft II. It was quite the compliment for the game, because I would consider LAN parties an earlier form of “viral marketing,” and it succeeded. Because the game was easy to learn, mildly challenging to play, and hard to master (especially in multiplayer format), anyone unfamiliar with the game at a LAN party could easily play and learn the game, in a matter of hours. Of course it helped that in just a few short hours, it was engaging enough that you would be hooked and want to keep playing. One of the other key things to remember is that multiplayer gaming wasn’t the popular driving force behind PC gaming then as it is now. Some of that popularity can be drawn from Quake, which had a massive multiplayer following, and Warcraft II. It’s not an easy correlation to make if you weren’t gaming at that time, but if you were, they were the popular titles. In fact, I remember some LAN parties that drifted between both Quake and Warcraft II. But enough of the lineage and big picture. what about the game itself? 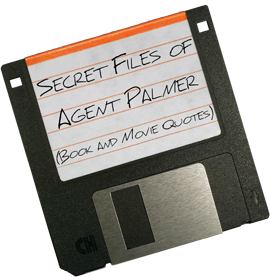 The gameplay was simple and close to the original, in that resources such as lumber and gold were required to build things and farms were required to feed the army you amassed to destroy your opponents. But Warcraft II did get some additions from the original which expanded the world. First and most basic, was that oil was added as a new resource type, which made seafaring units possible. Those new naval units were also joined by the new addition of flying units. 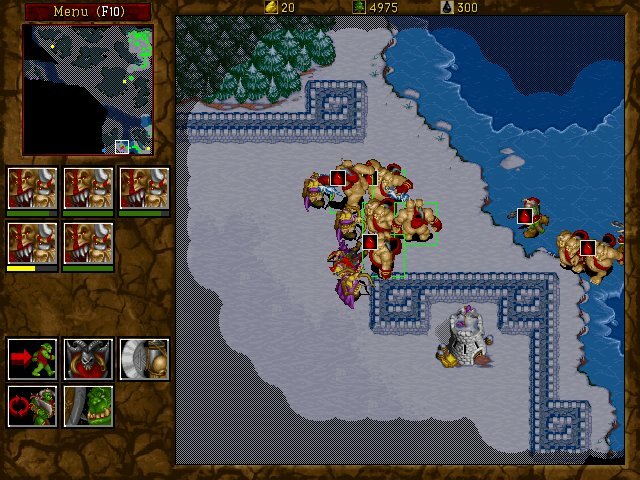 And let’s not forget that in Warcraft II you could command up to nine units at once, a huge increase from the one-at-a-time style in Orcs & Humans. Another notable and history-making addition to the game was “Fog of War.” This mechanic meant that you could see where your units were and had been, but you could only see the land and not enemy units on the land if you had no units in direct sight. Direct site varied for each unit, but this mean if you wanted to know what was going on, you had to have a unit nearby. 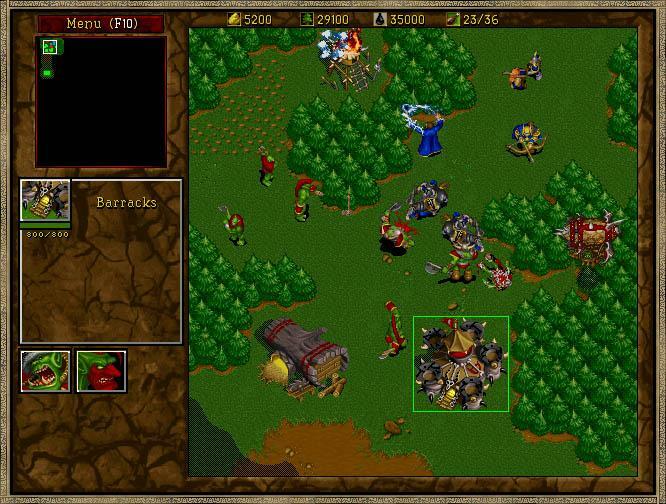 The concept of Fog of War has since been adapted into other games, but it’s first breakout appearance as a game mechanic was in Warcraft II. Other upgrades from the original, were the ability to choose map size and customize maps. These two enhancements were part of what made Warcraft II so replayable, because you weren’t limited to what was on the disc. You could expand maps with almost limitless options, from how many natural resources would be available and what size map it would be to a map of nothing but islands or no water at all. The end of the game could have been tedious, but only for the losers. Wandering around the map, looking for the last enemy unit could have been a bore, if not for the fact that you had basically won the game and were just looking to clean house and finish your opponent off. The presentation was great. The graphics had been upgraded from the original and the screen layout with mini-map and controls was something that had been used in strategy games almost since the beginning of the genre in games like Civilization and Sim City. The upgraded resolution was actually double the resolution of the original, as Warcraft II was released at SVGA 640 x 480. It seems small now, but was much bigger back in 1995. The graphics and animation were much improved as well, making the whole gaming process more enjoyable, but it was the little things, specifically the sound effects that made Warcraft II endearing. The sound effects were not quite as various as they are in games today, but for 1995, it was jam packed with everything you could ask for and more. Click on a peasant too long and you would hear “leave me alone” and “I’m not listening,” while Orc peons would say “zug zug,” “dabu,” and “hee hee hee that tickles.” Every unit had a sound effect and quotes that, if you continued to click on them, would be funny. This really was part of the endearing fun of Warcraft II in longer games. The game itself was released on all of the big platforms of the day – DOS, Linux, AmigaOS 4, Mac OS, Saturn, Playstation and Windows. Although many players found gameplay easier with the keyboard shortcuts on a computer, it still did well on Playstation and Saturn. 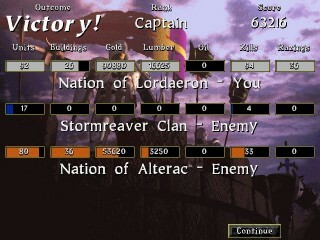 The critical acclaim of Warcraft II was phenomenal, netting it high scores by almost all reviewers. Not only did it garner those good reviews, but it won almost every award there was to win and has since been inducted into a few gaming Hall of Fames. 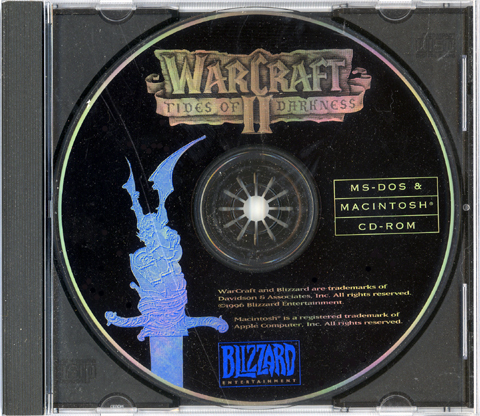 The success of Warcraft II: Tides of Darkness elevated Blizzard into the company of elite gaming software giants alongside Westwood Studios, id Software (Doom, Quake), and LucasArts which had a hand in many games. 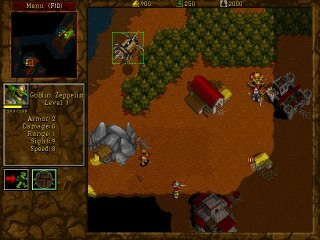 In fact, the real-time strategy boom in the mid- to late-1990s can be directly attributed to the rivalry between Blizzard’s Warcraft series and Westwood Studios’ Command & Conquer series. But Blizzard didn’t stop there. From the success of Warcraft II, Blizzard created Diablo a year later and made itself one of the de facto leaders for PC gaming in the late 90s. Without the success of Warcraft and Diablo there would be no World of Warcraft, not just in name but in principle. The technologies and the gameplay mechanics of World of Warcraft can both be directly attributed to those in both the Warcraft and Diablo series and the game’s legacy continues outside of the name. 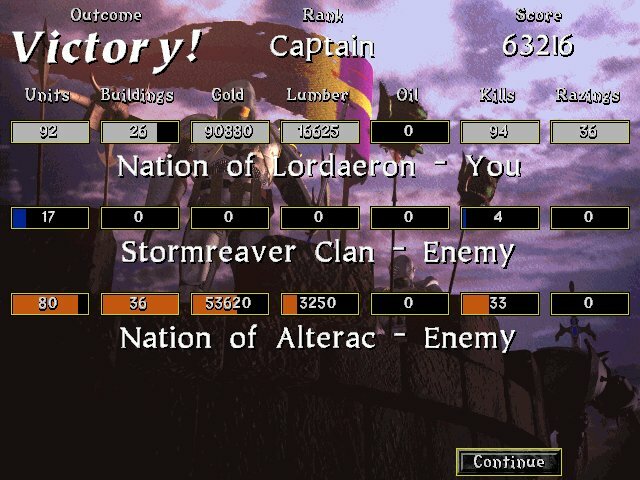 Even in 2002, players were still playing the game on DOS or using the Battle.net Edition. It sold millions of copies and was translated into French, German, Italian and Portuguese. It spawned Warcraft II: Beyond the Dark Portal, Warcraft III: Reign of Chaos, and Warcraft III: The Frozen Throne. World of Warcraft was taken in a new direction in what would have been Warcraft IV. Outside of gaming, it has spawned novels, comics, a collectible card game and it will eventually have its own feature film. The entire Warcraft series since Orcs & Humans and Warcraft II through World of Warcraft follow the races and worlds of Azeroth. Warcraft II was a beacon for gaming at a time when first-person shooters, like Quake and Duke Nukem, and turn-based strategy games, like Civilization, were the big money makers of the PC gaming industry. Going back into the annals of video game history to 1995, nine years before Blizzard Entertainment had created World of Warcraft and one year before they had created Diablo, they had already changed the world of video games. 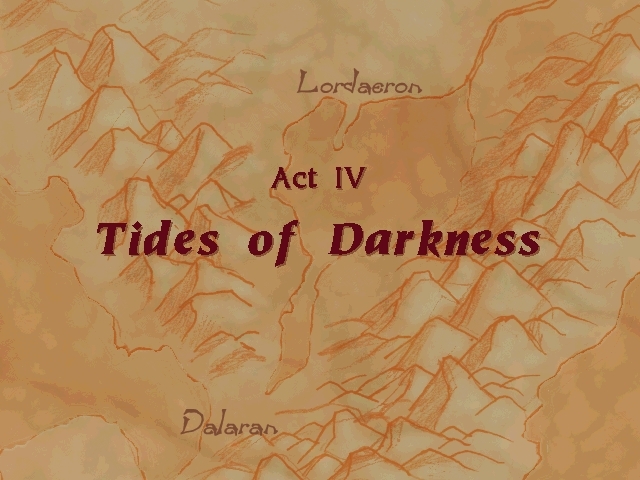 Warcraft II: Tides of Darkness wasn’t just a cute game. It was a widespread wholly accepted great game, and that was a belief shared by all who played it and some who still do. I still get my copy out and play it on occasion, and it unsurprisingly holds up. But then again, why wouldn’t it? From a nostalgia perspective, the game is exactly as you remember and can still be challenging. Ye,s it spawned a few expansions. However, I believe it was the success of Diablo and Diablo II that lead Blizzard to take the Warcraft series in a different direction and create World of Warcraft. For some, myself included, having never taken the leap in MMORPG gaming, it would have been fascinating to see what Warcraft IV or V or VI would have looked and sounded like if it had stayed on a linear path. 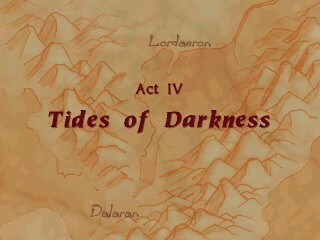 Wishful thinking aside, Warcraft II: Tides of Darkness was and still is one of the greatest. After all these years WCII is still my favourite game ever and I hope that Blizzard will finally return to the franchises RTS-roots again. It would be nice if they went down that road, as WOW starts to fade out… But I don’t foresee it coming soon as much as I want it to be here today!